Heather brings 15 years of marketing communications experience to a number of our clients including iShares, BlackRock, Alliance Global Investors, and Envestnet. While at Tiller, she also worked closely with AARP Financial on the development of the award-winning Financial Jargon and Inflection Points campaigns, and with the ING Foundation to build their Partners in Empowerment platform and ING-Girls Inc. Investment Challenge. 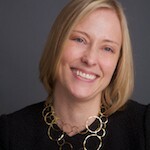 Heather joined Tiller from Wechsler Ross & Partners, a leading marketing and design firm specializing in the investment management industry, where she oversaw complex, strategic marketing communications programs for clients such as Bank of America Private Bank, Merrill Lynch Investment Managers, Principal Financial Group, and Ariel Capital Management. Prior to Wechsler, Heather was a member of the retirement plans marketing team at John Hancock Financial Services (previously John Hancock Funds) where she was responsible for the implementation of education-focused communications programs for 401(k) plan participants and development of the first personalized enrollment kit in the industry. She is a graduate of University of Rochester, Rochester, NY. What keeps you busy besides Tiller? It’s important to me I give back to the places and organizations that have played a role in how I am today. So, for example, I spend a lot of time working with a couple of nonprofit organizations in upstate New York. I also love to explore the ever-changing city of New York, travel, and spend time with friends and family — and food is almost always involved. What is it about Tiller that makes you proud to do what you do? It may sound cliché, but everyone at Tiller is genuinely passionate about what we do and doing the right thing for our clients and our programs. It’s refreshing to be surrounded by that level of enthusiasm and accountability every day. What is your favorite book or quote? Prior to Tiller, have you ever had a job or experience that had a profound impact on you? How? Immediately out of college, I was an admissions counselor at a large university in Boston where I met potential students of all ages and backgrounds — incoming freshmen to international transfer students to older students exploring a career change. I came away with a much better understanding and respect for not necessarily following a traditional path in life and what really matters is enthusiasm for what the future may hold. Where do you see the business environment going in the next five years?